"South Africa's Best Humour Columnist"
The name is Clarke. James Clarke. I have been told by people who know their way around the electronic world with its iPads, USBs, processors, modems, 500 gb hard drives, Blackberries and microwave ovens, that as a writer I have to have a blogsite. Otherwise, I am told, it is like passing oneself off as a CEO and you haven’t a leather chair that tilts back. Yet after four years of having a blogsite I still don’t really understand what it is or how it helps sell my books which is my major concern in life apart from not stepping on cracks when walking on the pavement. I am also told that on a blogsite it is customary to refer to oneself in the third person. This enables one to grossly exaggerate ones attainments without appearing to have done so personally. He long ago settled in South Africa where he became a mover and a shaker in the world of the environmental sciences. As a youth, being a mover and a shaker, had made it impossible for him to follow in his father’s footsteps as a bottler in a nitro-glycerine plant. Hence he turned to journalism. But around the time he retired a few years ago he found a new pursuit as a humorist. 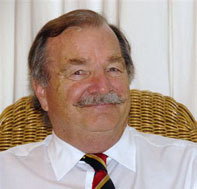 He wrote a daily humour column in the Johannesburg Star (now syndicated) and began turning out books of humour in the UK and South Africa. Clarke very recently moved boldly into the electronic publishing world. It was, he said afterwards, like a non-swimmer diving into a pool without first testing its depth. He did this with the full realisation that he is totally at sea in the electronic world with its telephones that take movies and receive faxes and sports results. 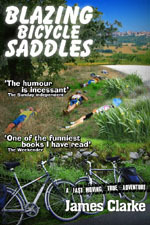 The original edition of “Blazing Saddles”, published by Jonathan Ball, has been out of print for two years. It reveals the true story of how six retired men – five of them journalists – year after year set out (intrepidly) from the African continent on a series of exploratory expeditions cycling into “Darkest Europe” to bring back to the people of Africa tales of its funny natives. Clarke will also shortly be publishing, via Amazon.com, another of his action-packed autobiographical books – this time an account of his Second World War exploits as L*E*A*D*E*R of the Yellow Six Patrol of the 1st Streetly Boy Scouts in the English Midlands. He recounts the patrol’s ceaseless campaign to defeat Adolf Hitler’s plan to invade England. You can read about “The Yellow Six” within this blogsite. Clarke, apart from moving and shaking, is a travel writer and proud father of two highly successful daughters – one a biologist and the other an environmental impact analyst. He and his wife, Lenka, live north of Johannesburg. I enjoy history and if you think it lacks humour then you haven’t heard of “feel-good history”. I was taught it all my schooldays in England during World War 2. I learnt about “Rule Britannia” and the Empire and how the British bought lots of Africa and Asia, freehold, for vast sums of beads and little bags of salt and tobacco. African-American Baseline Essays, published by the Portland Public Schools Board of Education, has as its objective the task of making African-Americans feel better about their past. But some historians might consider that the authors of a certain essay went a little too far in asserting that Africans – genuine black ones – invented the aeroplane. They aver that the Ancient Egyptians were indeed black and they developed flying machines. Frankly I cannot see why there should be a controversy. It is common knowledge in the circles in which I move – mostly very tight circles – that the Ancient Egyptians had aeroplanes and flew them all over the place. These planes were at first called pharaoh-planes in honour of an 18th dynasty Pharaoh who financed the research and development. After the Pharaohs died out the “ph” was dropped and the machines were simply called araohplanes (later spelt aeroplanes). A site, believed to be an ancient pharaohdrome, has been unearthed very near where Cairo’s airport is today (loc cit.). The first Ancient Egyptian aircraft was developed at Luxor by none other than Damocles Caliph III and was named the DC3 in his honour. It was known as a heavier-than-air machine on account of it being made of the same type of stone as the Pyramid of Khufu. Few Egyptologists are prepared to admit that the pyramids were designed not as tombs but for launching the first pharaohplanes. Slaves would drag the machines to the top, pour honey down the sides of the pyramids and tip the aircraft down the slope. The first planes, being, as I say, heavier than air, naturally nosedived into the sand. Undeterred, Thutmose IV ordered a lighter and more porous sandstone to be imported from Thebes and this led to the first reported flight by Menhubotep II (none other) in 1286 BC at Kittihorus (Ibid., op cit. sit op.). Many who witnessed its one and only flight – which was not terribly successful, the plane having crashed at the First Cataract – cried out: “A swan! A swan!” From this incident, Aswan, just below the Cataract, acquired its name. Not surprisingly, Eurocentric history books do not record that Nefertiti began her career as an air hostess with Ancient Egyptian Airlines (Annals of Ramses II 1174 BC, tablet 34). The general manager was none other than the up-and-coming Tutankhamen. It is also not widely known that another great Egyptian queen – Cleopatra herself – began her adult life as an air hostess (el al). Cleopatra eventually founded her own fairly successful airline – Cleopatra’s Air Operations (C-Air-O) – the name later being adopted by the Egyptian capital. Nebuchadnezzar of Babylon, after defeating the Egyptians by verily smiting them with large catapulted rocks, took over the airline but unwisely began a price war with the Bedouin caravans whose camels were, in fact, much faster than even the later Bronze Age planes, weight still being a bit of a problem. The last Ancient Egyptian airliner to fly – although the word “fly” is somewhat inappropriate here – had none other than the Roman, Pontius Pilot, at the controls. It crashed at A-syut in the Lower Nile valley and, according to legend, A-syut derived its name from Pontius Pilot’s last words before hitting the ground. James Clarke on Is it safe? Allan Ridley on Is it safe? normawinchdesigns on Is it safe?